The nozzle determines how large media you can use, and how much work you can do in a given period of time. There are two main determining factors when selecting a nozzle. First and foremost the amount CFMs (cubic feet per minute) your air compressor will produce. Secondly, the size of the media. Media come in a wide range of sizes. Media manufacture will be able to offer grit and nozzle size recommendations to suit your application. 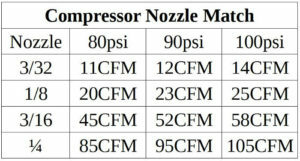 Using the chart below as a reference guide, you can determine which nozzle your air compressor will handle. 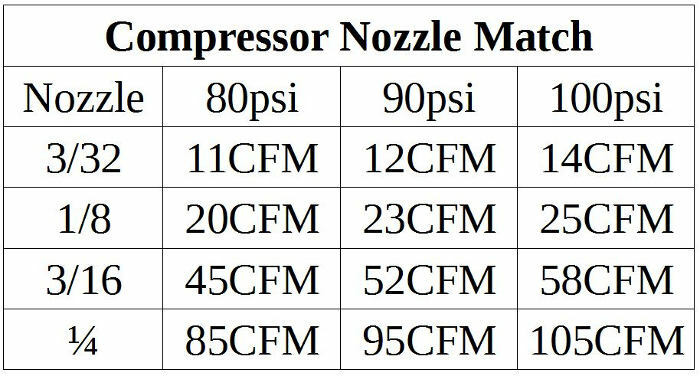 Once you determined the nozzle size, you can then select a media to match the diameter of the nozzle opening (nozzle size). For more information on nozzles, their function and selection, check out the Nozzle section in Blast School 101.